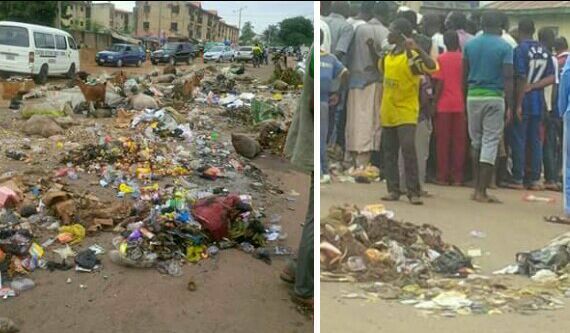 As a result of alleged non payment of their salaries for five months by a major refuse collection contractor employed by Kaduna State government, some youths, who said they are sub contractors, on Wednesday blocked major roads at Barnawa, Kaduna South local government area of the state to draw attention of Governor Nasir El-Rufai to their plight. Apart from blocking the major road with heaps of refuse, they also interrupted free flow of traffic for hours to express their anger against non payment of their salaries by their employer. Efforts to reach the Commissioner, Ministry of Environment and Natural Resources, Shehu Balarabe Giwa for comment proved abortive as he was not on seat and his mobile line was switched off as press time. However, a cresible source in the ministry told Daily Sun that, “the state government has only one contractor, Global Alliance Refuse Collection Company which is saddled with the responsibility of managing refuse across the state, thereby denied owing any contractor five months salaries as the contract was signed in less than two months. But I don’t know if the key contractor is owing those they employ to the job”. Assistant Youth leader, Barnawa ward 2, Mr. Bala Onaja, who spoke on behalf of other protesters, lamented that the current hardship in the country does not allow any serious employer to owe his employee up to five months salaries. According to him, in June this year, the state government handed them over to a private company, stressing that they were paid for two months and of the two months paid, not all of them were lucky to get paid the little amount the contractor is paying, adding that most of his colleagues were disengaged leaving only 50 of them to do the same work they were doing before reducing the workforce. He further added that they were not getting their salaries as at when due before the sacking of their colleagues, noting that even when their colleagues were laid off, nothing was paid to them thereby worsening their situation. “With the sacking of our colleagues, nothing has changed in terms of paying our salaries in spite of the few of us that were retained because l am talking to you, we are being indebted for months”, he said. Onaja then appealed to governor El-Rufai to immediately come to their rescue by directing the company to pay their salary arrears before the celebration of Eid-e-kabir next week.